Yarnitis a.k.a. too much yarn? Just over a week ago, I received a pretty healthy sized box of yarn in the mail. 4 new projects worth, to be exact. A vest, a shawl, a sleeveless sweater and a loose knit summer sweater. This yarn is meant for patterns I found online marked easy. I don’t want to attempt anymore projects marked intermediate. While I adore my newly finished shawl, the pattern was mistakenly marked “easy”. However, I knew from the onset there would be problems. First issue was that I evidently can’t read or count very well because the whole thing had to be ripped back after I was already 400 meters into it. So that set me back. Then, I managed to finish the knitting, blocking and sewing, but the crochet was left. I think there is a condition of reduced cognitive ability whereby a person can read the words and they should flow into a set of actions, but for a select few of us, they do not. That is crochet instructions, seriously. I am fine, if someone knowledgeable sits beside me and corrects me each time I veer off. I guess knitting and crochet are related. They both require a stick like device to create patterns of knots, but that is where the similarity ends. While I covet the projects that can only be completed with crochet, I have to reign in the craziness. I do not need a queue of more unfinished projects that belong to the criteria, “things I don’t know how to do, yet.” Now that would just be crazy. No, I’m not there yet. I’m only slightly ill. Like a low-grade fever, I’m acting a bit strange, not quite my normal, logical, practical self. I get it into my head to research yarn for a new project and there she goes….of on a tangent. What’s 4 new projects? Doesn’t sound so bad, right? Well, it wouldn’t be except for 2 other reasons. First is that I have started 7 other projects on needles and have yarn at the ready for 2 more. I have recently abandoned at least 2 projects, rolled the yarn back up or given it away. Oh, that totals 13, unlucky. So fine, I don’t like one of the yarn colors anyway – so that goes too. Now I’m back to 12. But I digress. The other reason that 12 projects might be a tad too many is I am a very slow knitter. Added to the fact, (or maybe the reason for it), I don’t have very much time to knit. 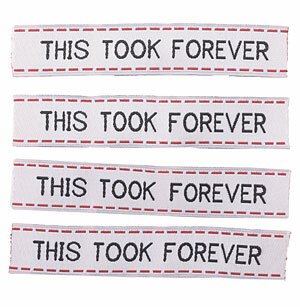 These are labels you can actually buy to sew into your hand made goods. Funny, yes, in a sad but strange sort of way. I have to be strict with myself here. Because every time I finish something, or give up a pattern, the yarn goes into my stash. And that is taking up more and more space. But we are renovating and I get a whole new “creative” space where my knitting supplies and my formidable fabric collection can be arranged. I never thought I would need to buy furniture to house all this stuff. So this entire shelf is really just temporary. We can’t have friends over for dinner like this. Next Saturday morning, this will have to move to the floor of my room. When will the renovation be done again? 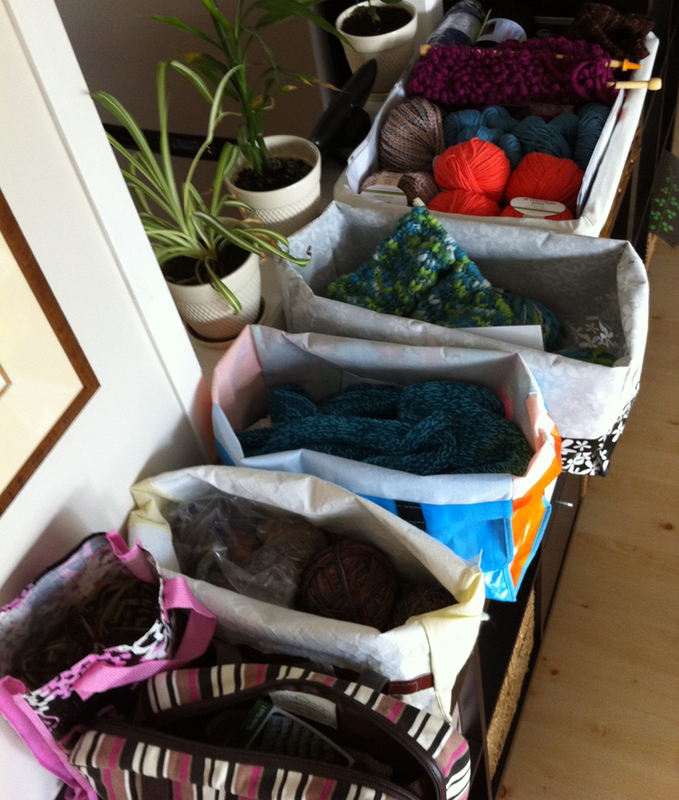 Maybe I can get one sock and a dish cloth done this weekend, which would remove the bottom 2 bags from this photo. I know, not thinking big enough, but the rest of these are garments, not measly accessories. The next bag up is a sweater I started in Mexico 3 months ago. I just booked tickets for the same trip in 9 months time….I would really like for that sweater to be done by then. I suppose not, thanks for stopping by.